An illustration of Marcellus Williams, who is scheduled to be put to death in Missouri on Tuesday. But there is one sure thing, according to two people who’ve witnessed executions in Missouri and Georgia: Pentobarbital is a potent means of death. The FDA-approved manufacturer of the drug will not sell directly to any state for use in an execution and has made it clear it doesn’t want third-party distributors to do so. Any compounding pharmacy that makes small, quick-to-expire batches is shielded from public knowledge, too. St. Louis Public Radio's Erica Hunzinger explains how pentobarbital works and why Missouri's source is still a secret four years after the state began using it in executions. Experts argue that such secrecy makes it difficult to know whether Missouri’s capital punishment process is constitutional. “With a policy that is as important as the death penalty, and that has results that are so final and irreversible, it's important that the policy be carried out in the light of day,” said Rob Dunham, the executive director of the nonprofit Death Penalty Information Center. How pentobarbital works in a clinical setting. Simply, pentobarbital is “a drug that slows down the electrical activity of the brain and nerve cells,” according to Dr. Aarti Sarwal, a neurologist and the medical director of the critical care unit at Wake Forest Baptist Medical Center in Winston-Salem, North Carolina. Pentobarbital is used in humans and animals. In a veterinary setting, it’s mostly for euthanasia, Dr. John Dodam, a professor at the University of Missouri-Columbia’s veterinary school, said. He noted the pentobarbital used in that situation is for animals only and has species-specific versions of the drug. For humans, it’s mostly used in operating rooms and intensive care units to treat uncontrolled seizures and brain swelling. 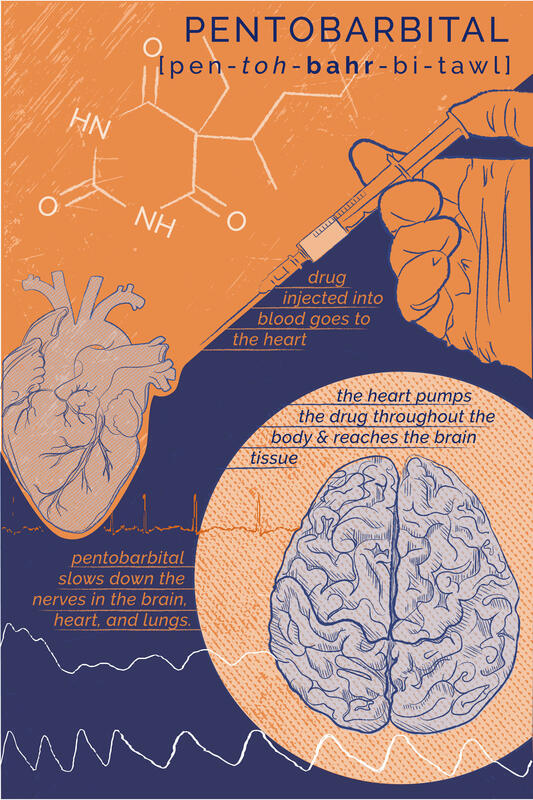 When injected, the drug goes to the heart and is pumped throughout the body. She described how pentobarbital affects a body when used in operating rooms and ICUs to treat uncontrolled seizures and brain swelling. What follows does not address executions. “Same happens for breathing: The brain centers that regulate your breathing, as well as the nerve cells that help the breathing muscles work, get slowed down. … It also has several other effects, like slowing down your stomach activity and pretty much any other activity in the body that's controlled by nerve cells,” she said. And it isn’t a drug that just any doctor can prescribe, Sarwal cautioned. “Pentobarbital is a drug that has to be given by qualified providers who are specifically trained to monitor the dosing and side effects … So, this is not part of typical medical school training. (Doctors) do get trained in understanding the side effects but it does require special training, and the use of pentobarbital is restricted to specific professions,” she said. 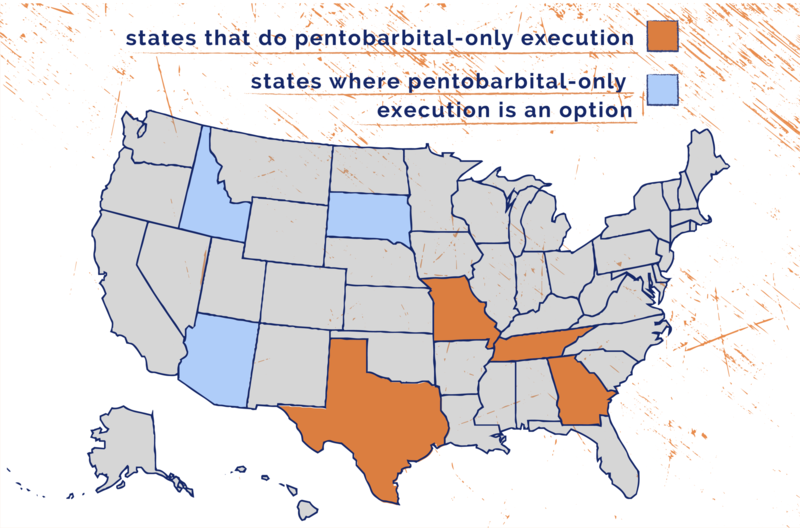 Ohio was the first state to use a single-drug pentobarbital protocol in executions in 2011 (it changed to a two-drug protocol a couple of years later when pentobarbital became tougher to purchase). Texas followed in 2012, with Georgia and Missouri joining in 2013 and Tennessee in 2015. Other drugs, mostly used in two- or three-drug protocols, have led to botched executions, such as the sedative midazolam in Oklahoma and Ohio. That’s not the case with pentobarbital, though that’s not to say there haven’t been problems. And in 2015, Georgia had to cancel a scheduled execution because the pentobarbital was stored at too cold of a temperature. “And what happened was the solids that are combined with the liquid to create pentobarbital separated. So there were clumps in the containers that had the pentobarbital,” Cook said. Missouri’s protocol calls for inmates to be injected with five grams of pentobarbital. That makes for a quick, lethal dose. Witnesses say it looks like little more than someone falling asleep. “There is seldom anything for us to really talk about except to say the person was executed, might have gasped a couple of times and then became silent and was pronounced dead a few minutes later. … There's nothing especially dramatic about it. It's very clinical,” according to Bob Priddy, the former news director of the statewide radio network Missourinet. Missourinet's Bob Priddy describes the state's execution chamber, what witnesses can see and the chain of events when an inmate is put to death. Missouri’s protocol calls for the medical personnel on the execution team to check whether a prisoner is dead after “a sufficient amount of time.” When asked for an estimate of how long that is, Department of Corrections spokesman David Owen said it’s about five minutes, which Priddy corroborated. Cook has seen 26 executions in Georgia, many of them with the pentobarbital protocol. She said that witnesses can see inmates’ faces. She continued to describe what happens as the execution begins: “What I've seen on occasion is the inmate will look at one of the arms, like he felt the drugs moving through. … You can tell it's happening because they will struggle to keep their eyes open. The last one that I saw, he insisted on smiling as much as he could. He would smile and then the smile would drift away and he would, like, shake himself awake and smile again. “But what happens is you just see them go to sleep. And you can see their chest moving, and then after a while you no longer see their chest moving. … It's very respectful, as much as it can be. But it's very quiet,” she said. Rhonda Cook, a reporter at the Atlanta Journal-Constitution, talks about Georgia's execution process and what a witness sees during the capital punishment process. There’s a lot at stake with a pentobarbital-only protocol, according to Megan McCracken, an attorney with the Death Penalty Clinic at the University of California-Berkeley law school. She’s worked on capital punishment cases since 2003. Pentobarbital is made by one of two sources: A compounding pharmacy or an FDA-approved manufacturer. Akorn is the only manufactured-pentobarbital supplier in the U.S. and has said it will not sell to states that use the drug in their executions, and it has asked third-party suppliers to follow suit. A Buzzfeed report in January by former St. Louis Public Radio reporter Chris McDaniel showed that, at some point, Missouri purchased manufactured pentobarbital, but the timing and the amount weren’t clear in the now-sealed court documents. Georgia and Texas are both transparent about obtaining their pentobarbital from compounding pharmacies, although the names of those pharmacies are state secrets. Dunham said that’s because the pharmacies don’t want people to know they make the drugs so they don’t lose business. The pentobarbital made at compounding pharmacies is “typically produced in anticipation of a pending execution,” because it’s shelf life is “weeks or months. You're not talking years,” Dunham said. On the other hand, manufactured pentobarbital, known generically as nembutal, is a different story, McCracken said. “... (W)hat we know is that back when nembutal was available to departments of correction, the expiration date was generally in the range of two to two-and-a-half years from the time of purchase,” she said. It’s unclear whether Missouri’s 34 vials of pentobarbital are manufactured or compounded. The Missouri Department of Corrections did not provide, as asked for in the public records request, expiration dates for the vials, saying the records are closed under state statutes. The document below shows the vial size for the state's pentobarbital is 100 ml of 50mg/ml solution, but agency spokesman David Owen said in an email that each vial is 50 ml of a 50mg/ml solution. The execution protocol calls for using 100ml of a 50mg/ml solution, so two of the vials. Gov. Eric Greitens and Attorney General Josh Hawley, both Republicans, have not spoken publicly on their stances when it comes to the death penalty. Despite numerous requests from St. Louis Public Radio, neither agreed to be interviewed nor provide statements regarding the death penalty process, the state’s secrecy or what Missouri residents can expect during either of their tenures in office. The state Department of Corrections declined all interview requests as well, but agency spokesman Cook said in an email that the agency is “prepared to carry out” Williams’ execution. The state Supreme Court denied a stay of execution Tuesday without giving a reason why. Williams’ attorney, Kent Gipson, had argued that new test showed Williams’ DNA was not on the knife used in the killing. It isn’t likely Missouri will shed more light on its execution process anytime soon. Until then, the public’s knowledge about pentobarbital will hinge on witnesses, medical explanations and lawsuits that move through the court system.